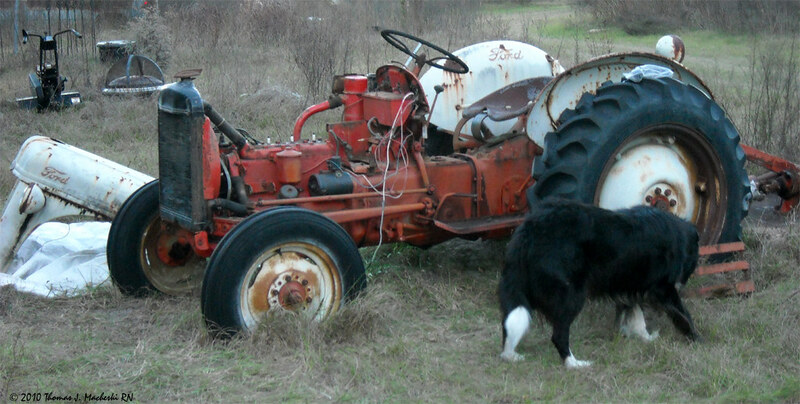 Life Is Art - Ramblings of Mad Shutterbug & the Border Collie Bros.
Harrison Ford 8N Tractor Growliebeast is in the process of receiving much needed maintenance. There is some 'cosmetic' work needed, however the primary work is related to power train. Examples: flush & check the radiator, flush & treat the gas tank (rust outside again), clean the entire power train off, replace some of the wiring, replace spark plugs & fuel filter, clean the fuel catch basin... perhaps you get the idea. With this much being taken off (radiator off today, off to radiator shop tomorrow) it simply is time to do a lot of things needing done. As in fan belt, too, eh? As we make progress on the work, I'm actually expecting other things to pop up. The cosmetic work is to treat rust spots on the sheet metal, both outside and inside on the cowling and grill, and on the big fenders over the drive wheels. Harrison is being rejuvenated, not as a collectors item but as a working tractor. I know people who collect old Ford and other company tractors. That's not my particular thing. I'm not collecting him, I'm working him. So while I'll probably stay 'close' in the paint over the rust spots to the original Ford Grey & Red, close is the operative word. One place I might 'give in' to original equipment won't even be exactly original. When these tractors were sold new, they operated with a six volt electrical system. Harrison is already converted to 12 volt (try finding six volt batteries, eh? ), but his generator is a complete replacement and the mounting for that... can you say jury-rigged? Sure. I knew you could. So I may shop around for a reproduction of the original six volt generator that's been 'double-wound' to make it a 12 volt generator. Then I could get back to the original mounts (still on the side of the engine block) and away from that jury rig. Houdini BorderCollie Bro is here inspecting work so far. Hopefully he will approve when Harrison is running again. He was bleeding coolant. *G* And rust. Yes, I can see the bleeding wires, too. About six hours of work into him at this point; things I left off include replacing the two front tyres. can I come help?? I'm bored...Gorram thesis is boring. Sure! More the merrier. Besides, at this rate likely to still be work to do when you do finish the gorram boring thesis. Because You Are Close To Done! true dat. This time next week it will be getting printed and bound. EEEEP!